Amazon $50 Gift Card. Shipped with USPS First Class Package. $200 Amazon Gift Card with gift box. Express shipping anywhere in the U.S.! AMAZON $100 GIFT CARD. Shipped with USPS First Class Package. How about a $100 Amazon gift card? Free shipping with USPS and will come with delivery confirmation. Payment must be received within 24 hrs or item will be relisted. Not responsible for gift card once it is mailed out. Gift card code cannot be sent via email and will NOT send even partial gift code. All gift cards will be mailed and tracking info will be provided. eBay does not permit using their gift cards to pay for a gift card so please don’t bid if that is your form of payment. No international bids and No PO boxes. No returns. 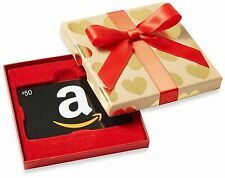 Amazon $50 Gift Card 2x $25 Gift Cards. Shipped with USPS First Class Package. This Amazon gift card has $25 on it. Ships only to the United States. Paypal only. I ship within two days after payment. Once shipped, allow up to 9 business days for delivery. Ebay's site won't allow Ebay gift cards to be used to purchase this gift card. Payment is required within 2 days. $300.00 Amazon Gift Card. Non reloadable. Free Shipping!!! Due to frequency of problem, will not send code via email. I can only mail directly to the winner of the auction. $100 Amazon Gift Card. Shipped with USPS First Class Package. Verified Paypal only, eBay account must have over 10 rating and over one year old! No exception. Amazon $50 Gift Card. Usps Same Day Mail. Shipped with USPS First Class Package. $10 Amazon Gift Card. Shipped with USPS First Class Package. 2 Amazon Kindle $25 Gift Cards* New & Unused *. Shipped with USPS First Class Package. Amazon $25 Gift Card Fast Free Shipping! . Shipped with USPS First Class Package. Gift Card is nested inside a specialty gift box. Gift Card has no fees and no expiration date. Amazon Gift Card $25.00 *FREE SHIPPING*. Shipped with USPS First Class Package. No returns. Code cannot be emailed. $50 Amazon Gift Card. Shipped with USPS First Class Package. Gift amount may not be printed on Gift Cards. Gift Card has no fees and no expiration date. Gift card number will not be provided. Gift Card is nested inside a specialty gift box. Gift amount may not be printed on Gift Cards. Gift Card has no fees and no expiration date. THIS IS FOR SECURITY REASONS! Amazon gift cards are a much better gift than an envelope of money or a greeting card with a check because they are safe, convenient, and easy to use online. Amazon gift cards resemble a credit card and have a sleek, recognizable logo design, and they never expire. $100 Amazon Gift Card, FAST FREE SHIPPING Redeem at Amazon.com . Shipped with USPS First Class Package. AMAZON $100 GIFT CARD. Shipped with USPS First Class Package. 4.5 out of 5 stars - Amazon $50 Gift Card, Unused, Free Shipping! 114 product ratings114 product ratings - Amazon $50 Gift Card, Unused, Free Shipping! (1) You installed the app with MY link and/or MY code. This auction is for $100.00 Amazon gift card, makes a great gift or use it yourself. Gift card never expires! Plastic gift card will be shipped to you for FREE via USPS First Class mail with a tracking number. Buy with confidence, check out our feedback! We guarantee the value of every gift card we sell! Please Note: This may be sent as two $50 Safeway cards or one $100 Safeway card based on availability also card design may be different from picture, Thank You. Amazon gift card. With overnight shipping if order placed before 12pm. All orders after will be sent out following day. All sales are final, no returns for any reason as gift cards are checked before. $100 Heavy Restaurant Group Gift Card Seattle. Shipped with USPS First Class Package. Once you use your gift card, don't throw it away! You can keep it as a cute bookmark. If you give this as a gift, it is pretty much 2 gifts in 1. The card has the full face value! Code has not been scratched off.